Steam irons made for hours of ironing because they are robust, comfortable to use and deliver professional results. In addition it is easy to iron out creases with the Lelit PG036/7 steam iron. This is because of the special holes in the ironing tip that channels a powerful jet of steam on creases. Busy dry cleaners and laundries across Ireland and UK use Lelit PG036/7 steam irons. As a result of weighing 1.8kgs Lelit irons are very comfortable to use. Also, the cork handle stops hands from over perspiring. It is easy to iron larger textiles because of the steam hose is 2.7 metres long. 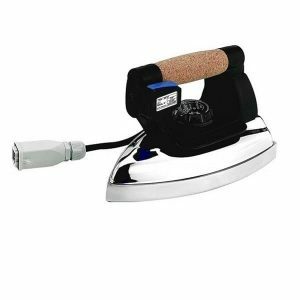 We supply a FREE Teflon iron shoe with all new Lelit steam irons. Teflon iron shoes protect irons from damage by buttons and zips. Also, they protect fabrics from damage by a hot iron. We keep a large stock of Lelit irons. As a result our delivery time is usually only 1 to 2 working days!